The standard cabinet height was a bit more than I wanted, so I set in a support shelf that keeps the saw deck level with the countertop. (The laminate I did here matches the laminate on my assembly table and on the countertop underneath upper cabinets elsewhere in the shop.) The saw fence lines up with the front of two raised platforms on either side, which effectively lengthens the fence for long workpieces. There’s a T-track on the left side platform for an adjustable stop. Speaking of longer workpieces, the distance from the blade to the left wall is a hair over 8’, so no problem handling standard dimensional lumber. See the drill press on the left? The drill’s column is behind the fence line, so it doesn’t interfere with long stock at all. I thought for a long time about the center opening and decided it’s a good home for my small compressor. When I add dust collection from a ceiling-run duct, at the same time I may take the initiative to also plumb an air line that goes to a couple spots in the shop. Still a few things to do like add toe kicks on those cabinets (and, obviously, clean up the mess), but I’m very happy with how this turned out. 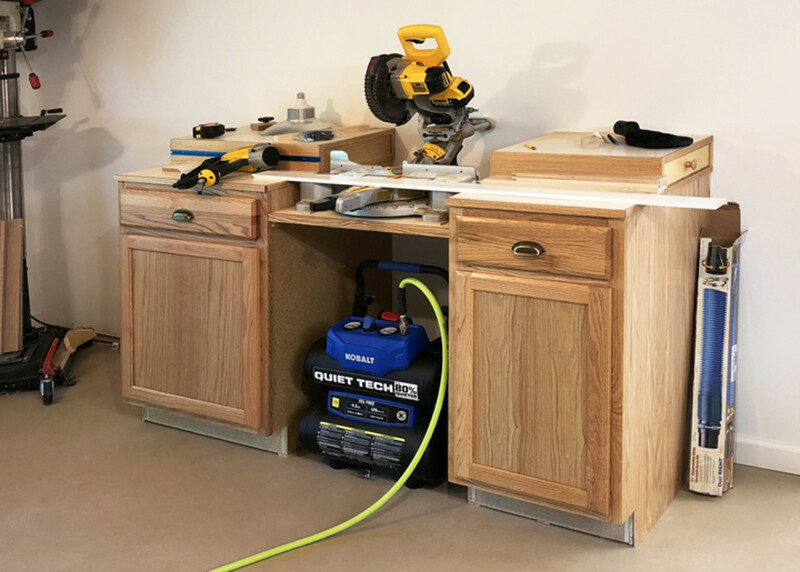 The store-bought cabinets made the work fast and easy, the location and dimensions exactly fit my needs, and now I never need to drag out the miter saw again just to use it – which guarantees it’ll get used a lot more than I’ve used a miter saw in the past. I’d like you to meet my two best helpers, without whom I’d probably never get anything done.